Microfluidic technology manipulates nanoliter volume of fluids in microchannels to achieve precisely controlled, efficient, and versatile nano/micro fabrications and drug encapsulations. In recent years, considerable efforts and increasing research interests have been devoted towards developing microfluidic templated drug delivery platforms. These microfluidic platforms have revolutionized the drug delivery field, which also have great potential to be scaled-up for industrial applications. This book explores advances in microfluidics for drug delivery applications from different perspectives. Topics cover the device fabrication, fluid dynamics, cutting edge microfluidic technology in global drug delivery industry, lab-on-chip nano/micro fabrication and drug encapsulation, cell encapsulation and delivery, and cell- drug interaction screening. Microfluidics for Pharmaceutical Applications is concept-orientated and features case studies of utilizing microfluidics for drug delivery applications in an accessible manner. 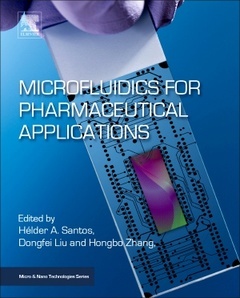 It is a valuable reference resource for understanding microfluidics for drug delivery applications, and also for those developing novel drug delivery platforms using microfluidics.